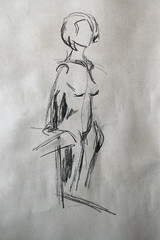 i've finally got round to taking pics of the life drawing i did last year. it was such a good thing to do, although the class was expensive and i think i might have gained more from the process with a different tutor. i’ve been assured by various people who should know that drawing can be taught, and i would have welcomed more direction. i do feel i progressed through the course, although i lost momentum rather towards the end. i forgot to date anything as i went along and now i don’t quite remember what order i did them, i’ve put them in the closest i can manage to chronological order in the gallery.